Has it already been one year? One year since I rolled into town in a rental car, after my Grand Am kicked the bucket in Wyoming. One year since I was introduced to Thai food, Top Pot Doughnuts, and this thing they call Pac 10 football (oximoron). One year since I was convinced that I would have a job in three days… when it ended up taking 3 months. Holy cow, it’s flown by. Ironically, I spent my 1-year anniversary on a plane headed home to Jasper. 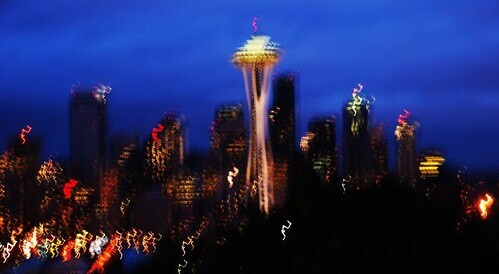 The year in Seattle has been a blur (much like the photo above). Seattle has been everything I thought it would be, and more. The experience thus far has topped any expectation, even though I’ve had bumps along the way. Downs: Missing weddings, missing births, missing family, missing friends, missing food, missing familiarity, missing out on day-to-day activities that your other friends will continue to do without you. Ups: New friends, a new perspective, new things to do, new adventures to be had, new food, new sources of entertainment, new sports teams to follow, new climate, new opportunities that never would have been presented had you not taken that one, risky, step. I work for a wonderful company and have an incredible job. I’ve got salt water to my left and fresh water to my right. I’m 1 hour from good snow skiing, 2 hours from great snow skiing, and 6 hours from the world’s best snow skiing. And, as of two weeks ago, my partner-in-crime living just down the hill from me. Although, none of this would feel right if this wasn’t the situation I was supposed to be in. Much props to all the visitors who have made the trek out to visit me over the past 12 months. For anyone who wishes for a place to crash… the offers always there. Hopefully the following 12 months will be even more exciting than the precious 12 months. Thanks for keeping up with my misadventures everyday. I hope that the stories are interesting, the videos are mildly entertaining, and the links are ever-the-more random. Ditto to everything you just said. I can’t believe its been a year for you and me both. Congrats!